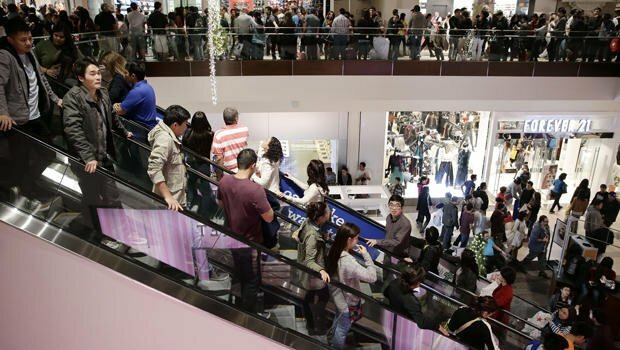 Outbreaks of violence have marred Black Friday shopping frenzy, as bargain-hunters besieged malls across the US. In Chicago, police shot an alleged shoplifter; a robber shot a shopper in Las Vegas; and a California police officer was injured in a fight. This year it began even earlier amid a trend for Thanksgiving openings. Twelve national chains opened their doors on Thursday, advertising aggressive discounts. Some 15,000 shoppers stormed the flagship Macy’s in New York City as it opened for the first time ever on Thanksgiving evening. Workers’ groups have protested that the trend towards Thursday opening means retail employees can no longer spend the day at home with their families, which is supposed to be the point of Thanksgiving Day. Some retail analysts have begun to dub the holiday Black Thanksgiving, or Grey Thursday. Workers held demonstrations on Friday outside Wal-Mart stores in the city of Ontario, California, and in Elgin, Illinois, demanding better pay and conditions. There was anecdotal evidence that the Thursday openings have led to an easing off in consumer footfall on Black Friday itself, though the increased popularity of online shopping could be another factor. By late Friday morning, the number of shoppers in many stores was more typical of a normal Saturday than the usual frenetic start to the holiday season. Some 97 million Americans hit the shops on Black Friday, according to the National Retail Federation. In 2012, Americans spent $11.2 billion on Black Friday.